Sumptuous characters and an enticing story are set against the harshness of the American frontier in this magical novel. 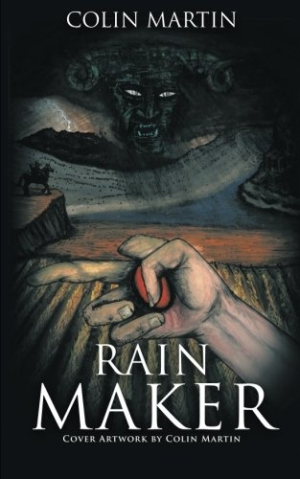 Colin Martin combines love, revenge, and frontier justice with just a touch of dark magic in the stirring and action-packed novel Rain Maker. Ethan Brooks isn’t a bad man, exactly—he has merely always done what it takes to survive. But while searching for water to save a dying stranger, Ethan finds a chance at redemption. Stumbling across a modest homestead belonging to an aging farmer, he discovers an opportunity to put his past behind him and possibly build a new life for himself. Having fallen in love with the farmer’s beautiful and willful daughter, Ethan will stop at nothing to save her farm and her family from an oppressive Kansas drought. Unfortunately, darker forces prey upon the family Ethan cherishes. Their village is run by a dogmatic and dictatorial soul known as “the Preacher.” The Preacher’s loathing for Ethan is nothing compared to his fear of the stranger. Can Ethan deliver the town from the Preacher’s oppression? Will he need to reach out to mysterious, and potentially malignant, forces in order to save those he loves from the withering drought? Martin’s prose evokes the dry and dusty Kansas plains, reflecting the desolation and deprivation felt by the characters. Without wasting a word, Martin conjures the parched and cracking earth, baking under an unyielding Kansas sky. This barrenness is reflected in the hopeless lives of the farming villagers who cling desperately to their fruitless religion and their misplaced faith in the imposing and secretive Preacher. The book’s arid atmosphere is juxtaposed with the budding romance between Ethan and the farmer’s daughter, Sam. Though Sam is simple and uneducated, her wild cleverness and natural innocence make for a perfect balance to Ethan’s worldly self. Though the Preacher and many of the townsfolk run toward stock characterization, Martin carefully cultivates the complexities of Ethan, Sam, and her family through elucidative dialogue and internal discourse. Through the creation of such rich characters, Martin illustrates the inherent hope of these hardy frontier settlers. With a steady balance of action, tension, romance, and hope, Rain Maker delivers a thrilling and heady tale with just a pinch of magic. Fans of historical and Western fiction will not be thrown off by the current of occult running throughout the novel, while admirers of magical realism will enjoy the rustic setting. Colin Martin’s Rain Maker delivers sumptuous characters and an enticing story line set against the harshness of the American frontier.